You can thank me later. Vistana is close to Disney, across the street from a real, albeit a little depressing, grocery store. It's chock full of nice amenities, including a store or two on property. The pictures online just don't do it justice. Nice apartments, with their screened patios, washer/dryer, full kitchen, grand master bathroom give you all the niceties of home. 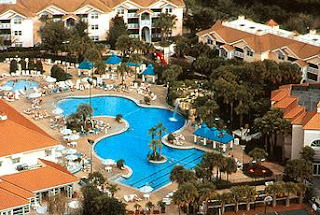 The giant pool in the picture is a fun place with lots of people, but there are a bunch of pools and hot tubs all around the property that feel much more private, and are usually right outside your back door. You can sit on the patio while older children swim. You can see the nightly midnight fireworks show from Disney's Pleasure Island from the Vistana property. They have their own on site Pizza Hut and 3 or 4 other eateries. You can play tennis, rent bicycles, watch the chameleons, use the fitness centers or the game room. Or you could just relax. There's a television in the living room and the bedroom. I can't remember if there was a television in the 2nd bedroom?